ATLANTA (April 4, 2016) - Mini Melts of America, Inc. announced today that it has entered into a strategic partnership with Georgia Aquarium and its food service company, Restaurant Associates. Georgia Aquarium is the largest aquarium in the Western Hemisphere. Mini Melts of America offers its delicious, super-cold Mini Melts® ice cream nationwide, at family-oriented venues and through a large and growing number of automated kiosks in mass retail locations across the country. Under the agreement, Mini Melts of America will co-brand its kiosks in the state of Georgia with “The Waddlesworths”, the South African family of penguins who now call Georgia Aquarium their home. Reduced-price admission coupons and discounts at Seaside Delights, a café inside the aquarium, will be available at the kiosks. “Our family loves other families, and we know a lot more guests will now have the fun opportunity to see us!” said George Waddlesworth, the (self-described) handsome head of the penguin family. “You know what they say about fun. It’s the best thing to have and what is more fun than Mini Melts® ice cream”, continued George. 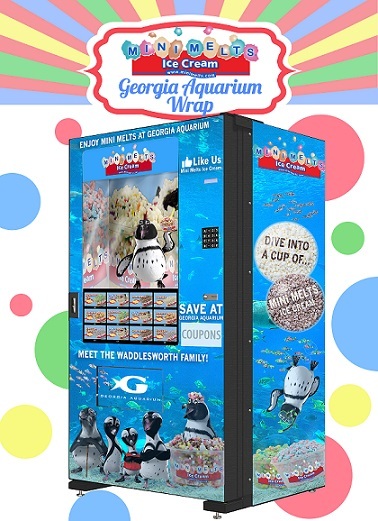 “We are honored to enter into this partnership with Georgia Aquarium and we are looking forward to helping promote the Aquarium’s conservation efforts by attracting more visitors,” said Dan and Shawn Kilcoyne, President and CEO of Mini Melts of America in a joint statement. “Our entire team is looking forward to this partnership and working with the staff at the Aquarium, said Patrick McKeown, Executive of Regional Development for Mini Melts of America, Inc.